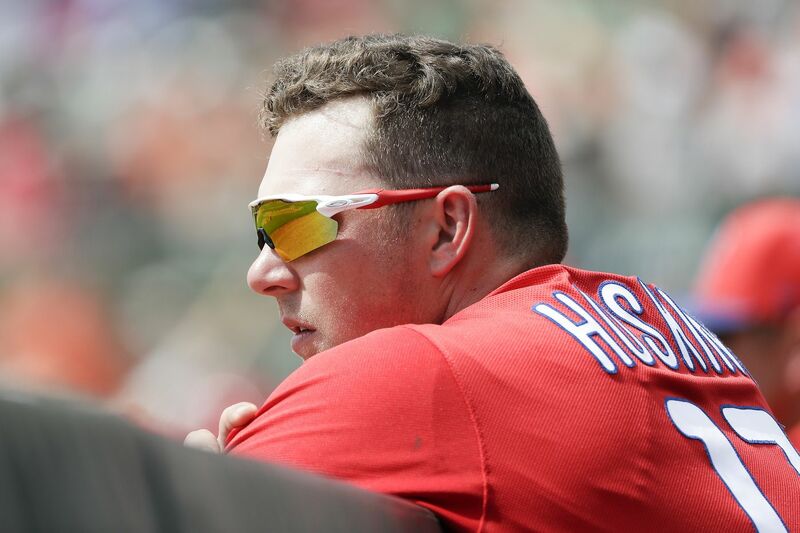 Phillies first baseman Rhys Hoskins keeps a close eye on his team at spring training. Rhys Hoskins didn’t have to work Monday. He wasn’t in the lineup, and the Phillies let players with significant workloads take recharge days. But he was in the clubhouse Monday morning. And in the dugout Monday afternoon. And at the pet-friendly, non-mandatory team picnic Monday evening. Hoskins actually had two days off in a row, since the entire team was off Tuesday as well. Four weeks into spring training, this is akin to nirvana. This all meant that Hoskins, around whom the Phillies rebuilt their lineup this offseason, probably could have completely avoided the ballpark if he’d wanted to. And it certainly meant that he didn’t need to put on a uniform, sit in the dugout and sweat through six innings of meaningless baseball. “What else are you gonna do?” Hoskins asked, as he peeled off his jersey and unlaced his basketball sneakers (cleats are uncomfortable; no sense doing penance). What else? Go home. Be with your fiancée, and your visiting family, and your gorgeous dog. This is @rhyshoskins’ dog Rookie. We know. We also know that when you’ve got a lead horse like Hoskins — a lead Hoss, if you will — the herd follows. Hoskins, 25, is attending just his second full spring training with the major-league club. But he’s hit 52 home runs and compiled an OPS of .882 in his first 203 games, and he’s more mature than most 30-year-olds. It seemed likely that Hoskins would at least leave the dugout after Bryce Harper’s last at-bat, in the fourth inning. He didn’t. Hoskins remained until Andrew McCutchen and Jean Segura came out, after the sixth. Harper discussed hitting with Mitch Walding, a 26-year-old minor-leaguer who, like Harper, has left-handed power. Nearby, Hoskins dissected each at-bat of Scott Kingery, his roommate this spring, and anticipated a postgame conversation that would, as usual, continue into the evening. Hoskins and Harper are not alone. Veteran pitchers like Jake Arrieta and Aaron Nola routinely will attend the practice sessions of other pitchers; just hang around, chatting about sequence, or delivery, or lunch. In fact, a quick survey of the clubhouse Monday indicated that several of the big-name players have adopted Hoskins’ unity initiative. Harper, of course, is among them, but also Jean Segura, Arrieta and McCutchen, whose son Steel romped all over the half-field during the crowded team picnic. This sort of effort is vital to chemistry when a team is drastically remade. The Phillies added five frontline players: McCutchen in left field, Harper in right, Segura at shortstop, J.T. Realmuto at catcher and David Robertson in the bullpen. All have a vested interest in creating a nurturing culture. This locker room dynamic might seem unremarkable, seen through the larger lens of all sports, but baseball clubhouses can be anything from detached to cliquish to toxic. With enough talent any locker room or clubhouse can produce a winner, but support and harmony can be a powerful catalyst. On Monday, several Phillies attested to the team’s collegial nature. The mood predated Harper’s arrival March 2, but he slipped right into the conversations, some of which go on and on and on. Bryce Harper talks with manager Gabe Kapler before the Phillies' spring-training game on Monday. There’s plenty of room for growth. Walding played first base Monday, but he’s been a third baseman most of his career. He hit 25 homers in double A in 2017, then hit 19 more last season in triple A, and is having a fine spring: 6-for-19 (.308) with a home run and two doubles, a 1.059 OPS and a team-high six walks. Kingery was the franchise’s top prospect in 2018, and he made the club out of camp, but he hit .226 last season. He’s 6-for-30 (.200) this spring. He appreciates the help. “Bryce is [seven] years in ‘The Show.’ It’s up to his discretion,” said Kingery. “A hitter like Rhys — he has a great approach. A great swing. If I can get something out of him, I welcome it with open arms." Being physically present, focused on the moment, can be a remarkable investment. “It’s cool, to stick around if you’re not playing,” Kingery said. "And you can get to know your teammates a little bit. We’ve got a lot of new guys. Gives you a chance to maybe talk about things other than baseball. It creates a good energy in the clubhouse and in the dugout.